No sane administrator wants to work in an environment that doesn't have a sensible Active Directory recovery plan that's designed to address a variety of possible failure scenarios. With the advent of Windows Server 2008 R2 and the well-known "Active Directory Recycle Bin," administrators have all breathed a bit easier, knowing that even more failure scenarios could be handled natively in the product. 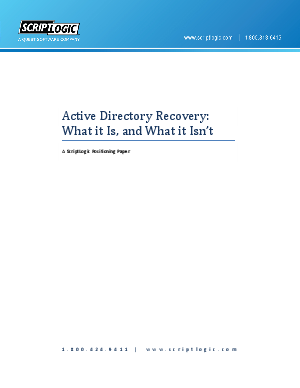 But that "Recycle Bin" is often misunderstood, as are some of Active Directory's other native recovery features. Some administrators also fail to give timeliness the attention it deserves. Look, we've all been involved in a bad situation where the boss was breathing down your neck, so we should all know how more important quick recovery is.